Some of the greatest experiences you will ever have will be crossing the country in your RV, exploring the U.S. with your family on a well-deserved vacation. While you go on a trip you might find yourself at multiple destinations inside mountains, lakes, or beaches where no shore power will be available. That’s when an eco-friendly solution will become the most attractive option. Solar energy is a free power source that can be used when you go on a trip by installing a simple portable solar system on the roof of your RV. 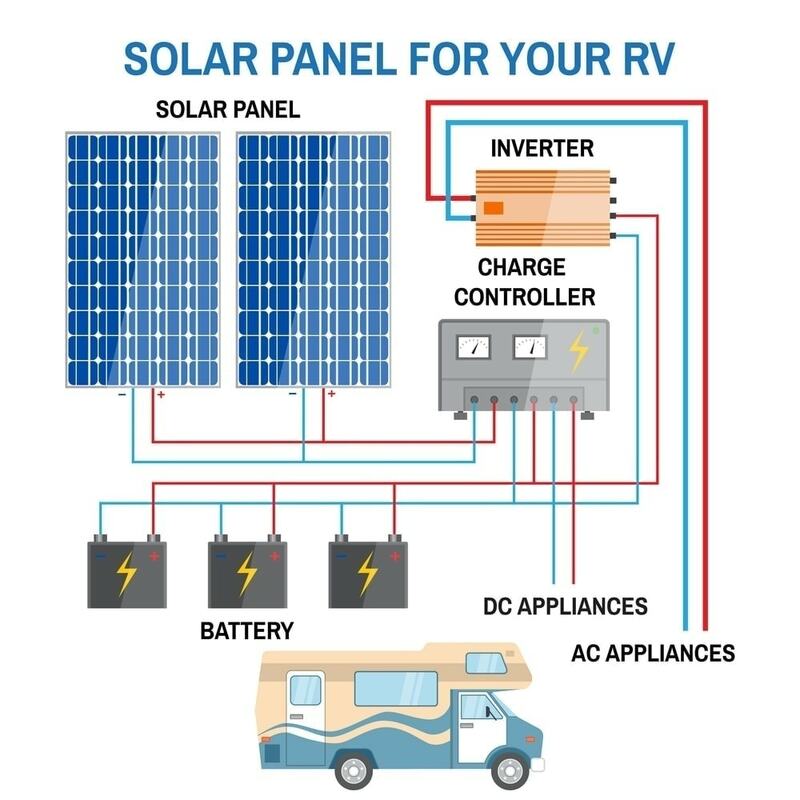 Here you will find a valuable guide of the best RV solar panel kits of 2019 which will help you choose wisely, learn how to power your RV with a self-sustaining and eco-friendly power source, and make the right decisions when going solar! Renogy is one of the best solar brands in the off-grid market. Renogy solar kits often include monocrystalline panels, a charge controller, mounting hardware and more components that make it an attractive solution. In this occasion, the Renogy 100-Watt solar kit for an RV includes a highly efficient 100 W monocrystalline solar panel with an efficiency of 18.4% and a corrosion-resistant aluminum frame that withstands 2400 Pa of wind loads and 5400 Pa of snow loads. There are other solar power kit options of 200 W, 300 W, and 400 W.
One of the best RV solar kits includes the Adventurer 30A PWM charge controller, aesthetically designed for RV flush mount applications. This device includes an advanced negative grounding to be coupled with batteries, remote temperature, and voltage sensors. It has its own internal electronics to protect the device and your batteries against a short circuit, overvoltages, reverse polarity, and overcharging. Finally, the kit also includes MC4 connectors and a waterproof / UV-resistant cable entry housing. WindyNation manufactures some of the best RV solar kits in the US. The brand offers a wide range of products like polycrystalline solar panels, solar cables, MC4 connectors, monocrystalline solar panels, MPPT, and PWM charge controllers. In this occasion, the WindyNation 400 Watt solar kit offers four 100-Watt solar panels, a 30A PWM solar charge controller with LCD screen, MC4 connectors, solar cables, and all that you need to install the kit. The 100-Watt polycrystalline module is a great option for RVs, cabins and other off-grid purposes. The solar panel has been tested under low irradiance and high-temperature conditions and has proven outstanding electrical performance. Also, the kit includes a 30A PWM charge controller with an LCD screen that shows voltage, amperage, ampere hours, temperature and DC load draw (if connected). The charge controller is ideal for your portable solar power bank because it has a battery temperature sensor, is compatible with AGM batteries, and is protected against short circuit, overload and reverse polarity. The kit will produce approximately 1600 Wh or 135 Ah charge per day. Suaoki is a company focused on providing portable power supply solutions to the market. Products include foldable or flexible solar panels, power inverter options, and reliable portable power stations. In this case we highlight a great flexible option to the RV market. The Suoaki 100 W 12V Solar Panel Charger Monocrystalline has an efficiency of 20% and has a stronger absorption capacity under low-light conditions than other modules. This particular model can also be used as a solar panel kit for camping. Moreover, the great advantage for RVs is that the module can be curved up to 30° which is very useful trailers, vans or boats where many available surfaces are not completely flat. The Suaoki solar panel is also water resistant with IP65 protection and weighs only 7.1 lbs. As with other flexible modules, this product is designed with a frameless designed and four metal reinforced mounting holes that make the installation much easier and faster, as only suction cups are needed to be introduced in these holes. On the other hand, the solar panel counts with a 2-year warranty that will ensure you a good performance of the product in that period of time. This is one of the best RV solar panels. The ECO-WORTHY 100-Watt solar panel kit is a simple and portable solution for campers that are looking for easy installations. 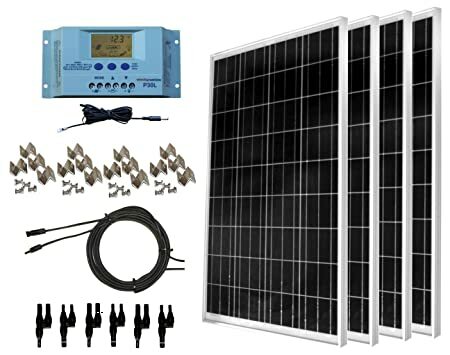 The kit includes a 100W polycrystalline solar panel ideal for a 12V battery with a corrosion resistant aluminum frame and a 20V open circuit voltage. The 100W polycrystalline module also includes an IP-65 rated junction box to protect it against low-pressure water jets (when doing the cleaning for instance) and small environmental particles. As one of the best portable solar charger kits, the product includes a 20A PWM solar charge controller that provides short circuit, over current, over discharge, overcharge, open circuit and reverse polarity protection. In other words, your solar power bank will be completely electrical failure proof. The solar charge controller also offers 5V dual USB ports for smartphone charging and a 4-stage charging (bulk, absorption, floating and equalization) intended for 24V or 12V batteries. The kit also includes a red and a black 16 foot solar cable with MC4 connectors to make an easy installation. 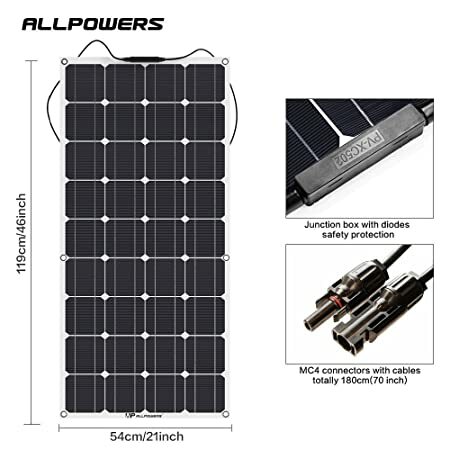 ALLPOWERS is truly the best brand for flexible panels because of its allegiance with SunPower (the best solar panel brand in the market). It is recognized as one of the top brands to deliver portable power source stations, compact power banks, and foldable or flexible solar panels. In this occasion, we examine the ALLPOWERS 100-Watt. The monocrystalline solar cell offers 21% efficiency that no other brand in the market can offer. Among some valuable specs of this module, you will be glad to know that it is tested against hail impacts, wind and snow loads, and only weighs 2 kg! The module is also water-resistant and is more durable than a traditional glass panel. It can also be curved at 30 degrees which makes it the perfect solar panel for boats, RVs, cabins or cars. Mounting the solar panel is very easy. It includes four metal reinforced mounting holes that you can easily attach with a suction cup. Also, the junction box is protected against dust or water and includes a blocking diode to protect your solar panel from reverse currents. Considering all the characteristics from this module, we can say it is one of the best RV solar panels. The other available model offers 50W power output. 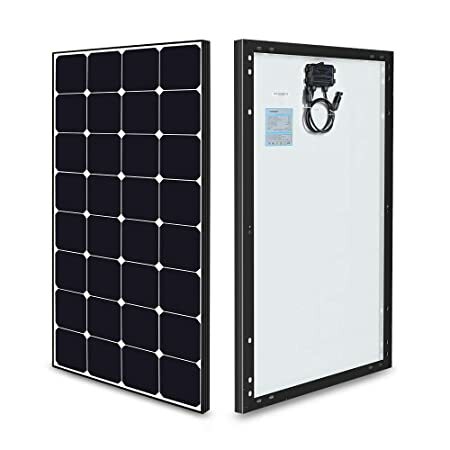 The Renogy 100 Watt 12 Volt Off Grid Solar Premium Kit is one of the best RV solar panels from the brand that includes a 100 watt solar panel, an MPPT charge controller and other components needed to install the kit. The Eclipse module is a monocrystalline solar panel with highly efficient cells that allow you to have 18.35% conversion efficiency. As with other modules, the junction box includes bypass diodes to reduce the impact of shades and ensure good performance under low-light conditions. It is also protected against low-pressure water jets and small particles. The reason why we can consider this as one of the best RV solar kits is that the kit includes a 20A MPPT charge controller. As we have discussed previously, the great advantage of an MPPT model is focused on tracking the maximum power point of the I/V curve in the solar panel at 99% efficiency. This means that the charge controller finds the maximum power point (MPP) of the solar cells and charges the battery at 12V while increasing the electric current to match the MPP. Therefore, your MPPT solar charge controller will have a much better performance than any other kit with a PWM model. KOMAES is a Chinese manufacturer of portable solar panel kits, pure sine wave power inverters, and charge controllers for off-grid purposes. 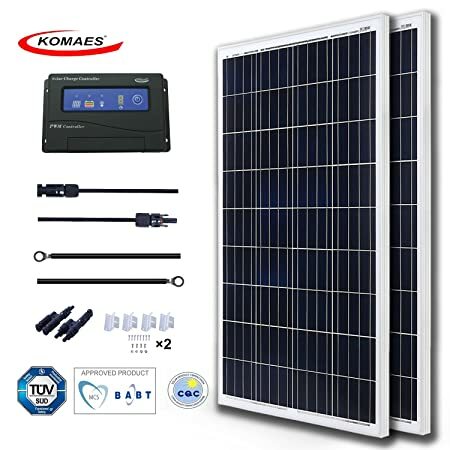 The KOMAES 200 Watts 12Volts polycrystalline solar panel tech kit is a simple starter kit to provide you with an off-grid solution for your RV. It is composed of two 100-Watt solar panels that together can produce almost 1000 Wh per day. 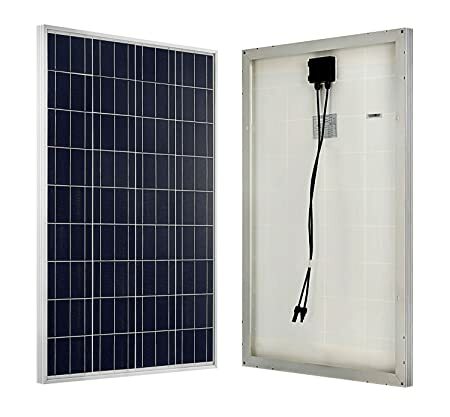 Each polycrystalline solar panel is manufactured with high resistant aluminum frames that have pre-drilled holes to make a fast and safe mounting. The solar panel is also designed with tempered glass that withstands wind loads of 2400Pa and snow loads of 5400 Pa and its performance warranty is of 25 years. The KOMAES kit also includes a solar charge controller with PWM technology and a 20 Amp output, along with a pair of 20 ft tray cables and 20ft MC4 solar cables. Other wattage outputs are available for 100 W and 400 W.
How Do RV Solar Kits Work? To live completely off-grid and use solar energy to power your appliances, you must purchase an RV solar panel kit. RV solar system kits are composed of several electronic devices that we must analyze in order to understand how they work. The most important of them is the solar panel. Solar panels are electronic devices that convert sunlight into electricity. They use the kinetic energy from small particles contained in light (called photons) to release electrons that generate DC electricity. Monocrystalline Solar Panels: Manufactured from a single silicon crystal that allows them to have a uniform appearance with excellent performance. This is why they are considered the most efficient solar panels. Polycrystalline Solar Panels: Designed from multiple silicon crystals that give them an irregular crystalline structure appearance. The efficiency rating of these modules is better than thin-film technologies but is lower than monocrystalline modules. Thin-Film Panels: These modules are very popular in RV solar kits because of their flexible and compact design. The efficiency rating value of this technology is lower than the other types, but their flexibility makes them an attractive option for the RV market. Solar panels generate electricity, but they cannot store energy. In order to use off-grid solar energy at all times, it is necessary to add a deep cycle battery. Deep cycle batteries allow us to store the energy that solar panels produce over the day. Also, they provide stability to the solar system to feed the loads with a good energy quality (no spikes in current or voltage) and provide backup power if the shore power fails. There are several technologies for batteries, but the most popular ones in RV solar kits are the lead acid batteries which can be classified as Absorbed Glass Mat (AGM), GEL, or flooded models. Batteries are maybe the most delicate and expensive components in any PV system. They are vulnerable to temperature changes and need specific charging stages over time. However, PV modules do not follow the specific demands of the battery bank. Solar energy is distributed across the day according to the available irradiance values in your location, following a Gaussian distribution curve. Therefore, if we decide to connect the solar panels directly to the deep cycle battery, we would shorten the lifespan of the battery and probably damage it. 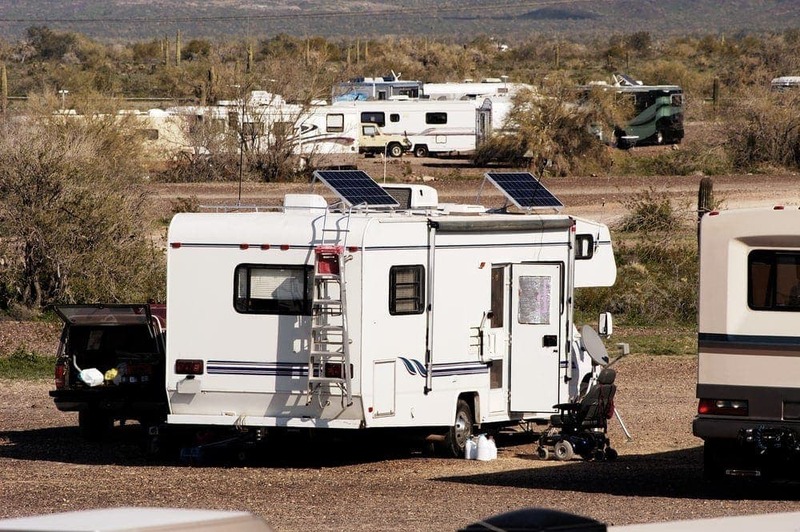 Thus, an essential component is needed in any RV solar power kit to charge the battery in a safe way. We are talking about the charge controller. Charge controllers are electronic devices that set the electrical output at the nominal voltage of the battery bank (typically 12 V or 24 V for RV purposes) and stabilize the current values from the solar panels to safely charge your batteries. There are two main types of charge controllers. The Pulse Width Modulated (PWM) model and the MPPT charge model. The PWM charge controller sets the voltage output at 12V or 24V and supplies the corresponding current in the I/V curve of the solar panel. On the other hand, the MPPT charge controller locates the maximum power point of the panel to optimize the power output while effectively charging the battery. In simple words, the MPPT model allows you to obtain higher energy yields than the PWM charge controller. However, since MPPT models are more expensive and an RV solar kit generally has a low power size, the pulse width modulated model is used more frequently in RV solar panel kits. Finally, the last component is not generally included in the solar kit, but it is essential for any RV solar system: the power inverter. This device converts the DC power into the AC electricity that our electronics and appliances use. The input of the power inverter is connected to the battery and the output is connected to the electrical panelboard of the RV. These products can be either pure sine wave or modified sine wave. If you want to know more, you can see a schematic of all the solar components inside an RV. How Well Do RV Solar Panels Work? 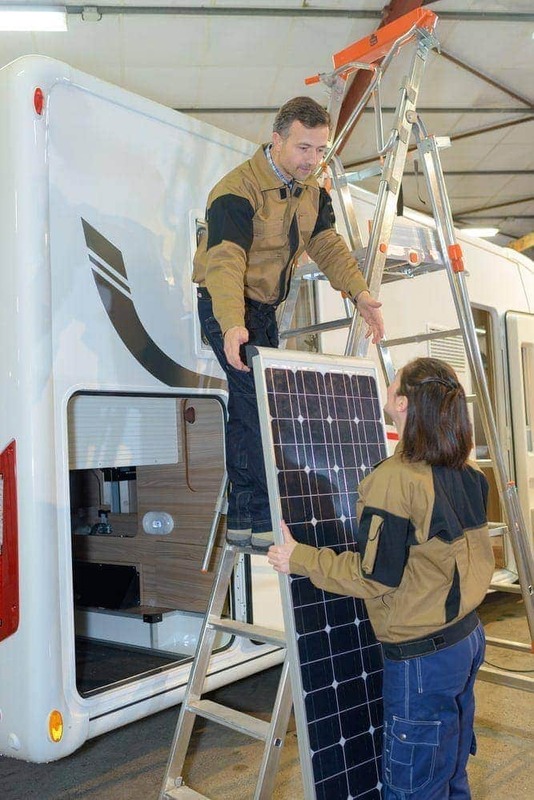 Solar panels for RV’s are generally associated with thin-film technologies that have been designed with silicon wafers of 200 micrometers thick (slightly thicker than a human hair). This design makes them extremely lightweight and flexible enough as to bend around 30 degrees without breaking apart (very useful for curved roofs in RVs). Moreover, they have a frameless design and they can hide easily thanks to their thin plastic sheet. Also, they can be easily glued onto the roof without any mounting hardware or any perforations, making the installation process easier and faster. The main disadvantage of flexible panels is related to heat dissipation and product warranties. Since they are glued onto the roof, they do not have any air circulation on the backside to cool down the solar cell, this translates into higher thermal losses. Also, performance warranties are only 5 years and product warranties only 2 years. On the other hand, rigid panels are the typical models that we can find in households that have installed a PV system. They have an anodized aluminum frame, tempered glass, and monocrystalline or polycrystalline solar cells to convert sunlight into electricity. These modules have been established as reliable, highly durable, and they’re even classified as the most efficient solar panels in the market. 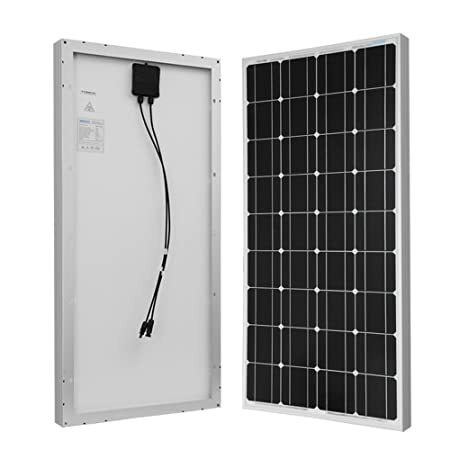 Rigid RV modules are designed to last up to 30 years with performance warranties that guarantee at least 80% efficiency by the end of the solar panel life during 25 years. They are also tested to endure severe environmental conditions with snow load and hail tests. In addition, they have excellent performance in hot summers because they have better air circulation on the backside. As you can see, flexible panels are best suited for RVers that go on short trips so the modules won’t overheat. Meanwhile, the rigid ones are ideal for boondockers that live off-grid for a long time. How Much Power can They Run? Each PV system is different because each design will change depending on how much power the customer uses. However, we can estimate some typical appliances inside an RV. As we can see the most demanding load draw is the refrigerator. If we take into account only the remaining loads, we would only be accounting for 905Wh per day, which we can round up to 1000Wh. In order to compare with a deep cycle battery capacity, we need to convert watt-hours (Wh) units into ampere-hours (Ah). Nominal battery bank voltages are 12 V or 24 V, so if we divide energy into watt-hour units by voltage, we obtain ampere-hours. In our case, if we use 24V (two 12V batteries in series) and 1000Wh energy consumption, we could translate it into 41-ampere hours. Therefore, with a 50 Ah battery bank capacity, you could power those loads every day. Using a 200-watt solar panel kit for an RV could be enough to completely charge a 50Ah battery bank of 24V in a couple of days and increase your grid independence. However, if we factor the refrigerator in the balance, we would have 5,105Wh of energy consumption. If we apply the same procedure but add two more batteries to have a 48V system, then we would need 125Ah daily. This can increase costs radically, but depending on your available space on the roof, it may be possible to cover those energy demands with some additional panels. As we mentioned before there are many appliances that our RV solar power kits can run for us. However, you may be asking yourself how many solar panels you need. The first thing that you must do is make a load demand table. Then, you must apply this simple equation to estimate the amount of power needed to run your appliances within a single day. For instance, if you are located in Colorado, we can estimate the irradiance values between 4 and 7.3 kWh/m2/day. If we assume and average of 5.5 kWh/m2/day and energy consumption of 1,000 Wh, then we can apply the equation. We could use solar kits for RVs with 300 W of maximum power to cover the energy needs of our appliances within a single day. The same procedure can be used to estimate the solar power that you need. Keep in mind that the k factor is referred to the balance of system efficiency values from NREL. It represents the typical losses in any off-grid solar system including the PV module tolerance, mismatch losses, AC and DC wiring, soiling, power inverter´s conversion efficiency, and battery round trip efficiency. What Size Panel Do You Need? To invest in a solar system, you need to keep in mind the power output that we calculated in the previous section. That value represents the maximum power that you need for your solar system. Solar panels have many maximum power values. Most solar panel kits for RVs have 200-watt or 100-watt sizes, but that does not mean that you cannot expand your off-grid system. 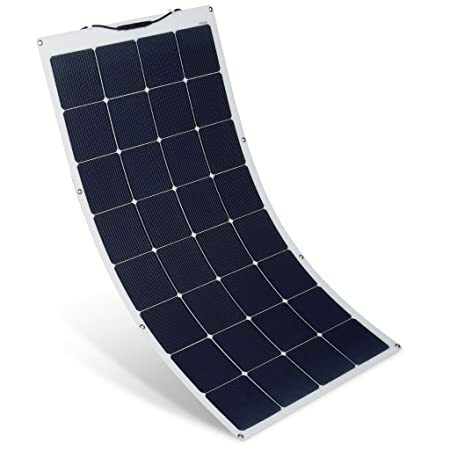 You can also purchase extra portable solar panels to increase your grid independence and power more loads. Actually, you can choose several small-sized 50W solar panels (just as the flexible module from SunPower) to have a 300W system. Or you can purchase three PV panels with a higher wattage (100 W) to cover the same amount of power. Purchasing modules with a higher wattage reduces the number of modules and costs as well. But it also means installing a bigger solar panel, and you may not have enough space to cover the amount of power that you need. A 200 W solar panel from SunPower can be 1,500 mm long and 800 mm wide. Do you have enough space on your roof for that? No? Then, try with 100W panels (1100 x550 mm). Can you put two 100W panels right next to each other to obtain a 200 W power output? Is it better than placing four 50 W solar panels? The available roof space in every RV is different, therefore there is not a simple answer. You must ask yourself these questions and try several configurations to find which is the best option for you. Another important fact to take into account is weight. Flexible panels have the great advantage of being lightweight, while the rigid ones are much heavier and require mounting hardware. Based on this decision, the available sizes for a solar panel will change. How Do You Install the Kits? Once you have purchased your solar panel kit, the next step is the installation process. If you are up for DIY projects, then installing a solar power system kit is a nice challenge for you. Check if you have every component ready: solar panels, charge controller, mounting hardware, cable entry plate, AWG solar cables, battery wires, fasteners, bolts, fuses, and breakers. 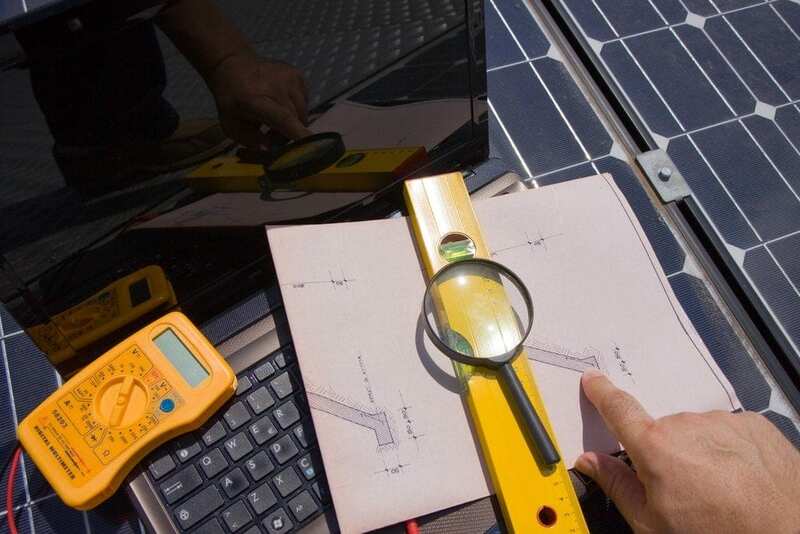 Verify the conditions of the products and if possible, buy an additional tilting kit that will help you maximize the solar power that your panels can produce. Install the mounting brackets in the solar panels while you are on the ground. Measure the size of the module and compare it with the available roof space on the RV. Draw a schematic of the positions where you will install each solar panel. Having a clear idea of where to place each module before you go to the roof will help you a lot. Keep in mind that you need to place the solar panel as far away as from any object that could cause shading as possible. The charge controller is easy to install, but you need to place it as close as possible to the batteries in order to minimize DC wiring losses. Locate an area where you could place it and install it using simple screws. Examine your RV and imagine the shortest possible path from the roof to the charge controller. Longer distances or low AWG solar wire sizes will translate into higher voltage drops and power losses. Once you have decided the path, the next step is drilling a hole through your roof to pass the AWG solar cables. Once the wires reach the charge controller, it is time to install the electrical protection devices to cover your investment against a short circuit. Install DC breakers between the cable run and the charge controller. Keep in mind that you need to install the DC breakers in an easy access location, just in case that you need to turn off your solar system quickly. These are easy to install. Install fuses between the charge controller and the deep cycle batteries to protect them from any overcharge. Then, connect the battery bank to the PWM charge controller using battery sized wires. Now it is time to install the waterproof cable entry plate with the MC4 connectors that should be connected to the 10 or 12 AWG solar extension cables. Use waterproof tape and a sealant around the cable entry plate to make sure you are totally waterproof. Drill the holes for the mounting hardware and install each solar panel on its position. Solar panels are easy to install, you just need to secure them to the roof. Make the corresponding series or parallel connections between the modules. Use the MC4 connectors and extension AWG solar wires to connect them with the cable entry plate. Remember, series connections add voltages, while parallel connections add electric currents. Check your charge controller’s voltage and electric current range before doing this. For ease of installation purposes, keep a small note inside your pocket to remember numbers and steps. Also, if you are looking for a PV system that is easier to install, choose flexible panels. You will avoid the need to drill holes and install mounting hardware for each module. How Do You Ground the Solar Panels? An off-grid power system also requires to ground the solar panels. Grounding is necessary to provide a safe pathway to any possible short circuit that may occur. Moreover, grounding your modules also ensures that you will always be able to touch them without any danger. The solar panel grounding is easy to install. The first step is choosing a small size AWG cable. Remember that there will be many cables in your RV, so to guide yourself, choose a green color for grounding. Once you have connected all your modules system with the same ground wire, you must send it through the cable entry plate to your RV. It will reach the room where the charge controller is located and it must continue to the base of the RV (via conduit if it passes through propane or batteries). Once there, drill another hole to the chassis of the RV and send the wire through that hole. Finally, you must bolt the ground wire from the solar panels to the chassis. Keep in mind that the pulse width modulated charge controller and the sine wave power inverter will also need to be grounded, and you must do it to the same reference spot. Testing a solar panel is really easy. All you need is a digital multimeter. Each module brings a nameplate on the backside with all the electrical output specs. Among those, two are crucial for our test. The open circuit voltage and the short circuit current. The first one represents the maximum voltage output and the latter represents the maximum electric current of the solar panel. Choose a sunny day to make the test, and at midday, place the solar panel with direct sunlight exposition. The junction box is located behind the module where two MC4 connectors are located. One represents the positive lead and the other one represents the negative terminal. You must measure the voltage using the digital multimeter and it should be slightly different from the open circuit voltage that appears on the nameplate. Meanwhile, the measured amount of current should be very similar to the short circuit current. If you will continue using your solar kit during winter, the first thing that you must consider is tilting your solar panels South. You would be amazed at how much power you could draw by tilting your modules during the winter season. You do not need to worry about snow on top of the modules because the snow melts down as the solar panels produce energy. However, if you are an occasional RVer and the snowfall is coming, you will need to winterize your solar power system. The first thing to keep in mind is to turn off the DC breaker of the solar power system. Then, disconnect the wires that go from the charge controller to the battery bank. Afterward, cover the solar panels with a black protective material that does not allow light to pass through. Remember that even when you are inside your home, the panels can generate some electricity with artificial light, so be careful handling them. More than getting worried about the solar panels during winter, you should be careful with your batteries. In order for them to have a long lifespan, you must store them in a safe, dry, and warm place with limited humidity. Keep in mind that you shouldn’t discharge your batteries below 50 % and that you should complete a 4 stage charging before storing them. Batteries get discharged over time, so make sure you charge a battery at least once every 1 or 2 months and remember to do maintenance as well. Choose AGM or GEL batteries to reduce the required maintenance. How Do You Protect Them From Hail? RV solar systems are exposed to outdoor conditions all the time. Constant and abundantly salty environments can lead to corrosion in the solar panels, soiling can reduce their efficiency, and hail storms can impact your modules at any time. However, the solar industry is aware of this. Manufacturers have designed their solar panels in order to endure severe environmental conditions. Every module must pass through quality tests to ensure it will be able to withstand standard climate conditions. These tests include thermal cycling, damp heat, twist, hot spot, hail impact tests, and more. The typical hail impact test involves throwing multiple 25 mm ice balls at 23 m/s against the solar panel’s tempered glass in different spots. Basically, tests and experiments around the world have proven that it is highly improbable that your solar panel will break due to a hail impact since it is designed to resist it. Nevertheless, if you are still skeptical and want to protect your solar panel kit against hail, you have two choices. The first is insurance. The second involves installing an iron or aluminum frame on top of the panels, ideally a little above the surface of the module. Also, you could use the foam included in the solar panel box to cover it and fasten it with a rope. That way the PV generators won’t receive the direct impact of hailstones. However, it could be a complex and unnecessary procedure.